Custom Metal Fabrication is such a broad field I cannot even name all that it would cover the title is self explanatory. I have worked with many others who either needed a Custom Part for their project or home. Some have need of Fabrication for their Boat, or whatever can be imagined. The image on this page is a prototype of an electronics console. There are actually 4 seperate units joined together in this horseshoe configuration. 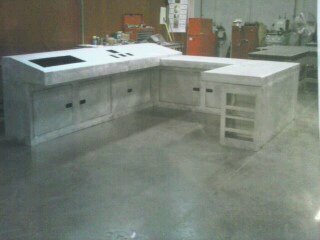 This entire unit was fabricated by me from flat plate. "If you can think it we can build it". When it comes to Metal Fabrication it doesn't matter if you are using Stainless, Aluminum, or Steel as long as you have a drawing( does not need to be professional) or you know exactly how or what you want I am confident we can Fabricate what you need.